SUTEAU-ANVER is a recognized world leading company, producing die cutting machines, and laminating machines. These presses are mostly used in standalone applications where the operator needs to pick up the parts from the cutting table manually. The receding head allows an easy access to the cutting area after cutting process. To increase the productivity, machines can be equipped with infeed systems allowing an easy infeed of the material to the cutting area. Advantage of this machine range compared to the receding head presses, is the cutting on belt operation mode. Machine is used where high production output is needed and where the customer is looking for automatization. Material infeed, cutting and outfeed is done on a conveyor belt, and the high accuracy of our machine range increase the lifetime of the belt. A mechanical press is mostly composed as follows: an unwinding or infeed table for the material, the cutting press, and an outfeed table or rewinding system for material and waste. Customized applications for kiss cutting or knock out systems can be integrated to the line. Our range: from 10 to 80 Tons with cutting area till 1000mm x 1000mm. As the mechanical ones, designed for high speed but with a rotating tool instead of the flatbed. The production speed of a typical mechanical press is about 180 strokes/min, and it can speed up to 500 RPM with our rotating press. Machines designed for applying a glue paper to a flexible material by pressure between 2 laminating rolls. 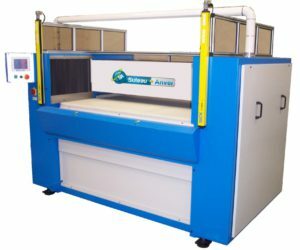 Machines can be equipped with several unwinders for the glue paper (top and bottom), material unwinders allowing to create a sandwich lamination (glue paper, material, glue paper for example). By integrating heating devices (IR emitters or heated rolls), we can increase the adhesion between the material and the glue. 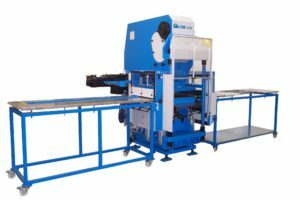 Our laminating machine will be designed in accordance with the specifications of each customer, taking into account the application and the budget.